The official music video for the song was released on Imagine Dragons' YouTube channel on May 2, 2017. The video was shot in Dubai, filmed in black and white. 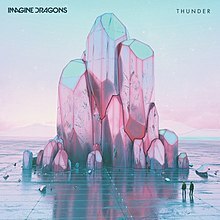 It features the band's lead vocalist, Dan Reynolds, singing and dancing among extraterrestrials, portrayed by dancers Haroon Al Abdali, Mamadou Bathily, and Gianna Gi, around a futuristic city. It was directed by Joseph Kahn. As of April 2019, the video has over 1.1 billion views, and over 6.5 million likes. It is currently the most-viewed video on the band's YouTube channel.